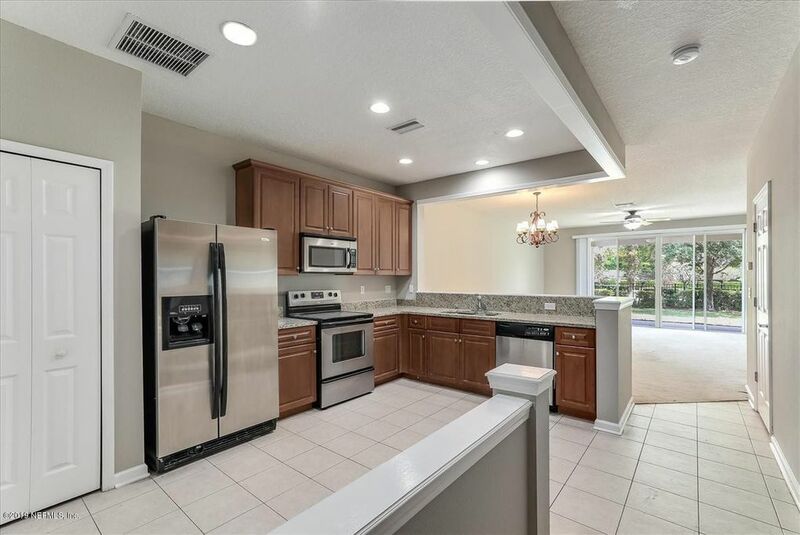 Beautiful 3BR/2.5BA townhome with 1 car garage in a gated Pulte community with 2 clubhouses, 2 pools, and 2 fitness centers. Guest parking spaces in front of the property for your convenience. Popular San Carlo floor plan features spacious great room, gourmet kitchen with stainless steel kitchen appliances, wood cabinetry, dining area, owner's suite with vaulted ceiling and walk-in closet, owner's bathroom with dual vanity, guest bedrooms with full bath, laundry area with full-size washer and dryer upstairs, and covered patio. Great location near premiere shopping and dining at St. Johns Town Center, business St. Vincent's hospital, Southside business park with easy access to I-95, downtown and the beaches.